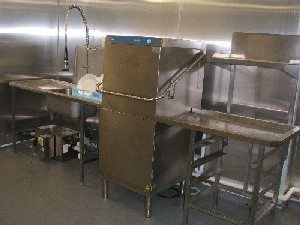 This is a superb chance to purchase a complete pass-through dish wash station complete with Inlet Table & Sink, Slash Back, Pre Rinse Spray & Oulet Drying Table and Hobart’s superb top performing AMX series dish wash. It is complete with spike & flat dish wash baskets. Baskets are filled and slid over the sink for pre rinsing. They are then loaded for washing and dried on the outlet table. Can be set up in-line or in a corner aspect if space is tight. This whole system can be installed by Caterquip if required by our national network of associate qualified technicians. Please call for more information. Inlet and outlet tabling can be supplied to suit your available space.